FtsA is essential for bacterial cell division, and co-localizes to the septal ring with FtsZ. It has been suggested that the interaction of FtsA-FtsZ has arisen through coevolution in different bacterial strains (PUBMED:9352931). FtsA is essential for bacterial cell division, and co-localises to the septal ring with FtsZ. 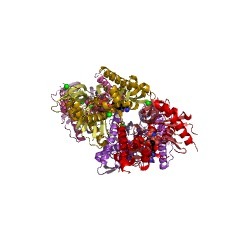 The SHS2 domain is inserted into the RNAseH fold of FtsA [(PUBMED:15281131)], and is involved in protein-protein interaction [(PUBMED:9352931)]. There are 14427 FtsA domains in 14427 proteins in SMART's nrdb database. Taxonomic distribution of proteins containing FtsA domain. This tree includes only several representative species. 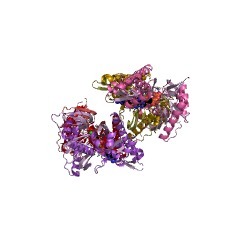 The complete taxonomic breakdown of all proteins with FtsA domain is also avaliable. 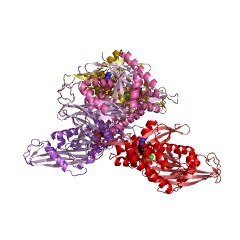 Click on the protein counts, or double click on taxonomic names to display all proteins containing FtsA domain in the selected taxonomic class. This information is based on mapping of SMART genomic protein database to KEGG orthologous groups. Percentage points are related to the number of proteins with FtsA domain which could be assigned to a KEGG orthologous group, and not all proteins containing FtsA domain. Please note that proteins can be included in multiple pathways, ie. the numbers above will not always add up to 100%.